The research in Meyers group centers on the investigation of the observables left by the early Universe. Principle among these is the Cosmic Microwave Background Radiation (CMBR) anisotropy and polarization. 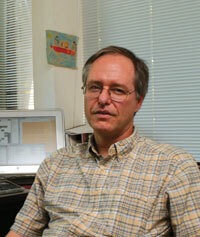 Meyer is a member of with the Wilkinson Microwave Anisotropy Probe (WMAP) satellite team. The group is developing new detector technology for future cosmological experiments. The detectors, Frequency Selective Bolometers (FSB) are designed to provide optimal use of telescope focal planes with a multi-spectral filled focal pane array. Future projects using this technology are the SPEED camera to be used on the Heinrich Hertz Telescope (HHT), a balloon-borne instrument to measure fluctuations in the Cosmic Infrared Background (EDGE), and a balloon-borne polarization sensitive instrument to study the sub-mm polarized emission from high-galactic latitude dust (TPX). EDGE is designed to measure the galaxy density fluctuations on scales above 50 Mpc using large-scale fluctuations in the Cosmic Infrared Background (CIB). Using the sub-mm color of the CIB fluctuations a low-resolution 3-D map of the large-scale structure of galaxies can be made. TPX is designed to provide a large scale survey of high-galactic latitude polarized dust emission to learn about the properties and environment of the galactic dust and also to understand the polarized dust foreground contamination for CMBR experiements. A second future project is the development of the South Pole Telescope and a large-format bolometer array instrument designed to map polarization of significant sections of the southern sky at mm and sub-mm wavelengths on angular scales from several arcminutes to 1/2 degree.